This card is for the Moxie Fab World's Window challenge. I cut a 4x8 piece of gold mirror card and folded it in half, so the gold sides were facing each other. I ran this double layer of cardstock through the Cuttlebug with both nestabilities in place. I had to run it through a few times, to make sure that the cut went through both layers. I then folded the card right-side-out and cut a small edge on the bottom so that it can stand. I cut a heart out of silver glimmer paper, and then used the round edge of the nestability to smooth out the top of the 'diamond'. Finally, I cut two banners and placed one directly under the other, so that there is a (small!) place to write on the inside of this card. 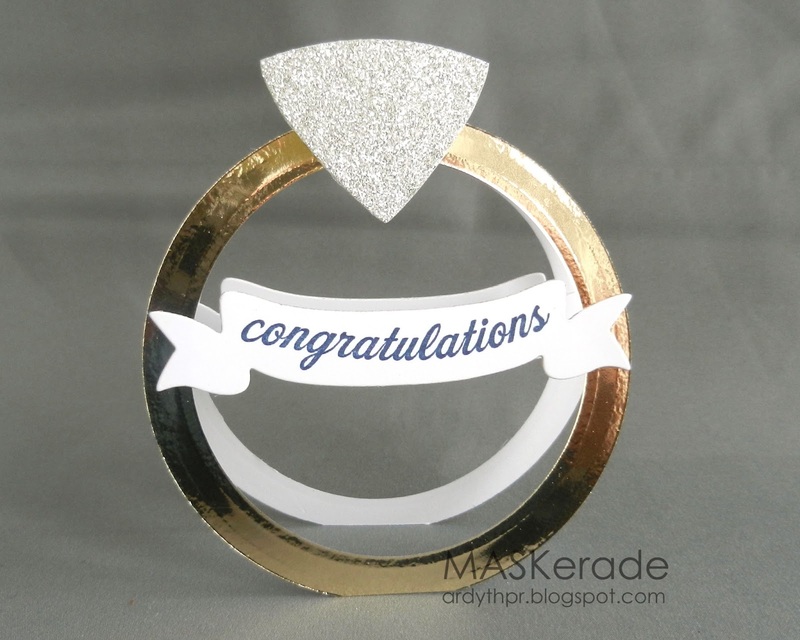 I think this will be a fun surprise for someone who is recently engaged or as a wedding card. This is so amazing! I love it and can't wait to CASE it too. This is just amazing! I love it!! WOW that is spectacular Ardyth. So clever and original. What a super fun idea! The window card is very clever. Love all the metallics!! How clever! It's so perfect for someone recently engaged! Ardyth, this just may be the cleverest card I've ever seen! Wow! Now that is just GENIUS! Great tip to cut the gold inside out too to keep it pristine. Your brain was working overtime on this one. How on earth did you ever think of it? So clever! Niiiiiice ... aside from it being fantastically cool, you left a small section of straight edge on the bottom so it can stand nicely. Smart one, you are, Ardyth, verrry smart. Love it!! *Rubbing chin* (Sore from hitting the desk top). Absolutely fantabulous!